Alex Faraday and her accomplices thought they were simply stealing diamonds from a Cape Town bank vault, but they also inadvertently scooped up an ominous MacGuffin. You might wonder why a corrupt U.S. senator would keep an incriminating flash drive in a South African safety deposit box. Better yet, you might wonder why he kept it at all. Regardless, Faraday has it, so his goons will do whatever it takes to get it back in Stephen S. Campanelli’s Momentum (trailer here), which opens this Friday in New York. Kevin Fuller lured Faraday back into thievery with the promise of a big score, but he never fully revealed the nature of the game he was playing. However, she figures it out pretty quickly when the American senator’s British enforcer, Mr. Washington, kills Fuller while she is hiding under the bed. Obviously, this puts Faraday in a tight spot. She is already wanted for capping a freelancer Moss brought on board when he started menacing the innocent bank customers. Evidently, Fuller was manipulated by Washington into stealing the chip and the diamonds from the super-secret vault-box, which makes no sense whatsoever, but here we are, so what can you do? If you are Faraday, you keep one step ahead of Mr. Washington, while doing her best to protect Fuller’s ingrate widow and her young son. 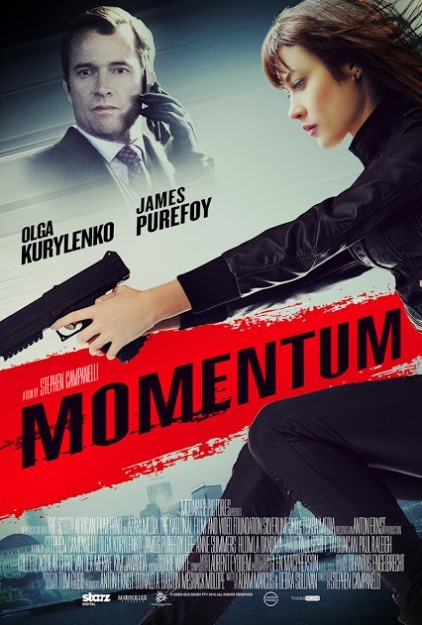 Basically, Momentum has one thing going for it, but it is significant: Olga Kurylenko as the action lead. She was the best part about Philipp Stölz’s middling Erased and here she fully realizes that potential. Kurylenko displays terrific action chops and even does some credible whatchamacallit . . . acting. James Purefoy’s Mr. Washington has a decently loathsome presence, but he would arguably work better as a secondary villain rather than the antagonistic lead. Instead of filling that void, Morgan Freeman literally phones it in as the senator, who only exists to give orders on his cell phone. Yet, the biggest problem is Adam Marcus & Debra Sullivan’s screenplay, which has the brains of a punch-drunk kangaroo. To give Campanelli credit where it is due, the initial heist scene is tight, tense, and mysterious. It utterly puts to shame the utterly shameful Checkmate. However, after Faraday’s big entrance, the causes and effects no longer make much sense. Still, the fight scenes, shootouts, and chases are all rather appealing in an old school, down-to-earth way. Campanelli keeps the pace cranked, but Kurylenko’s steely badassery is the film’s trump card. Although there are some appealingly gritty action scenes, the film ultimately panders to the lowest, most vile conspiracy theory paranoia, so good job ending on a buzz-killing note. Therefore, as a dramatically mixed bag that implodes down the stretch, it is hard to recommend Momentum, despite Kurylenko’s best efforts. For her diehard fans, it opens tomorrow (10/16) in New York, at the Cinema Village.